Skipper Stephen Fleming today smashed a brilliant unbeaten century to power New Zealand to a shock nine-wicket win in the World Cup over hosts South Africa who now have a tough task ahead to qualify for the super six stage. Shoaib Akhtar and Wasim Akram produced devastating fast bowling to dismiss Namibia for just 84 and give Pakistan a crushing 171-run victory in World Cup Group A today. James Anderson’s career-best one-day international haul of four for 25 set up a six-wicket win over Holland as England finally got their World Cup campaign underway here at Buffalo Park today. Although England made harder work than they should have done of reaching their target, a pair of stylish 51 from Michael Vaughan and Nick Knight were the cornerstones of a win that came with more than 25 overs to spare. With their egos badly bruised after the first two matches, a sombre-looking Indian cricket team arrived in strife-torn Zimbabwe here today, hoping to turn around their sagging fortunes in their next World Cup league match against the hosts on Wednesday. India were meant to be the sternest test for Australia in the qualifying round, but the defending champions mangled India by nine wickets as if they had been Bangladesh, British media said today relishing the downfall of the big-talking Indians. Indian cricketer Sachin Tendulkar is given flowers on his arrival in Harare on Sunday. India will play Zimbabwe in the city on February 19. 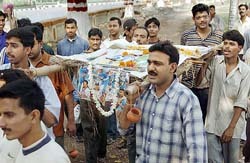 HARARE: Sourav Ganguly gathered with his bedraggled troops at the Johannesburg airport on Sunday morning. The team was flying to Harare for its’ critical game against Zimbabwe in group A on Wednesday. Slamming an “irresponsible” Sourav Ganguly for India’s humiliating World Cup loss against Australia, cricket legend Imran Khan said the Indian captain should follow the example of Steve Waugh and learn how to pull the team out of the woods. A supremely confident Australian side made short work of India with a combination of fiery pace bowling followed by aggressive stroke play. So far it has been a canter for Australia and unless something unforeseen happens they are going to enter the Super Six stage with maximum points and a big advantage over the rest of the competition. It was a spineless display from the Indian batsmen and perhaps the most surprised would have been the Australians. The toss was crucial, it was a fantastic track, and Ricky Ponting would have been anticipating a total of 260-something to chase. Some of the batting I saw from India, surprised me on Saturday. I think the problem was that they were trying too hard, and as a result were going for balls that they should have left. The hopes of a billion people lay grounded by a pathetic, spineless batting display. More than the loss, the ignominy of the defeat is hard to digest, as India were pummeled into submission by Australia at Centurion on Saturday. Even as India slumped to their worst-ever defeat in the World Cup in recent times to defending champions Australia at Supersport Park in Centurion, the minds of the players, according to reports available, were busy trying to find out an answer to the warning issued to certain members of the team on ambush marketing by the International Cricket Council (ICC). 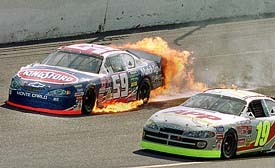 Engulfed in flames, Stacy Compton in the Kingsford/Johnsonville Chevrolet (59) drives through the second turn during the Busch Series Koolerz 300 at the Daytona International Speedway in Daytona Beach, Florida, on Saturday. Current champions and star studded Northern Railway, Delhi, defeated Western Railway, Mumbai, 2-0 to retain the title in the VIIth All-India Mohinder Partap Singh Grewal Women’s Hockey Tournament. Harjeet (Raipur Dabba) bagged the Mahabharat Kesri title and a cash prize of Rs 1.11 lakh while Baljeet Koonar was handed over keys of a Bullet motorcycle for securing the second position in the wrestling competition at Sardar Harbans Singh Purewal Memorial International Kabaddi and Mahabharat Kesri Wrestling Tournament here today. Sports events, which form part of the ongoing Patiala Heritage Festival, commenced on a vibrant note here today. A one-day golf tournament was held at the Army golf course, known as Black Elephant, today, cricket, polo, kabaddi and other rural sports will also be played. 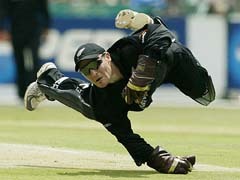 New Zealand's wicketkeeper Brendon McCullum dives to stop a ball during the match against South Africa on Sunday. Skipper Stephen Fleming today smashed a brilliant unbeaten century to power New Zealand to a shock nine-wicket win in the World Cup over hosts South Africa who now have a tough task ahead to qualify for the super six stage. In a rain-hit match, the fancied South Africans scored an imposing 306 built around a superb innings of 143 by opener Herschelle Gibbs. The Kiwis, who had to win this match to stay in contention, responded magnificently to achieve the reduced target of 226 in 39 overs after two rain interruptions which curtailed the play. They finished at 229 for one with 15 balls to spare. Fleming, who was dropped by wicketkeeper Mark Boucher on 53, remained not out on 134. South Africa, which was shocked first by West Indies in the Cup opener, will now have to win all the three remaining matches against Sri Lanka, Bangladesh and Canada. Fleming’s innings overshadowed another splendid batting performance earlier in the day by Gibbs who hit an adventurous 143 off 141 balls containing 19 fours and three sixes. Gibbs’ knock provided the hosts a perfect launching pad to down the New Zealanders who had lost all their previous one-dayers to South Africa in South Africa. 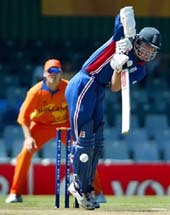 Gibbs shared four half-century partnerships with Graeme Smith, Nicky Boje, Jacques Kallis and Mark Boucher before being caught at deep midwicket off Jacob Oram in the 46th over. The bowler to suffer the most on a day dominated by the bat was Shane Bond who seemed to lack the experience and variation to handle the pressure situation. His ten overs cost New Zealand 73 runs for the lone wicket of Smith. Bowling: Bond 10-0-73-1, Adams 9-0-57-1, Oram 8-0-52-2, Styris 10-0-44-1, Vettori 10-0-58-1, Astle 3-0-16-0. Man-of-the-match Wasim captured five for 28 and Shoaib four for 46 as Namibia crumbled to the fourth lowest total in the tournament’s history in reply to Pakistan’s 255 for nine. Namibia’s innings lasted just 17.4 overs, but it could have been worse as they collapsed to 42 for nine before a partnership of 42 between Bjorn Kotze and Rudi van Vuuren. The last-wicket pair prevented the African side from posting the lowest ever World Cup total, still Canada’s 45 against England in 1979. Showing no mercy against a team of scratch amateurs, Pakistan’s fearsome opening bowlers terrorised the Namibians from the outset. Namibia lost five wickets in the first three overs, four batsmen made ducks and only three players, Jan-Berry Burger (14) and tailenders Bjorn Kotze (24 not out) and Van Vuuren (14) reached double figures. Wasim made the initial breakthrough when he had Riaan Walters caught behind without scoring in his first over, then Shoaib struck twice, having Stefan Swanepoel caught at slip by Inzamam-ul-Haq and sending the ball crashing into Danie Keulder’s stumps. Wasim, playing a record 34th World Cup match, got rid of Gavin Murgatroyd (4) and Louis Burger (0) in successive balls but missed out on a hat-trick. Shoaib was also on a hat-trick after dismissing Jan-Berry Burger and Gerrie Snyman, but failed to achieve the feat. Wasim dismissed Melt van Scoor (2) and Deon Kotze to complete his sixth five-wicket haul in one-day internationals and edge to within two wickets of becoming the first player to reach the magical 500 milestone. Shoaib, whose fastest delivery was timed at 159.1 kph, almost claimed a five-wicket haul of his own when he bowled Bjorn Kotze with the total on 52, only to see the delivery called a no-ball, leaving spinner Saqlain Mushtaq to mop up the final wicket. FoW: 1-47, 2-105, 3-118, 4-150, 5-208, 6-223, 7-227, 8-247, 9-248. Bowling: Snyman 8-0-51-2, Van Vuuren 10-1-47-0, B Kotze 10-1-51-2, L Burger 10-0-45-1, D Kotze 8-0-32-1, A Burger 4-0-18-1. FoW: 1-1, 2-3, 3-3, 4-17, 5-17, 6-32, 7-32, 8-35, 9-42. James Anderson’s career-best one-day international haul of four for 25 set up a six-wicket win over Holland as England finally got their World Cup campaign underway here at Buffalo Park today. Anderson’s haul helped restrict Holland to 142 for nine from 50 overs. Although England made harder work than they should have done of reaching their victory target, a pair of stylish 51 from Michael Vaughan and Nick Knight were the cornerstones of a win that came with more than 25 overs to spare. At the close, Ian Blackwell was 22 not out and Paul Collingwood five not out. But the Netherlands, beaten by India in their opener, could take heart from middle-order batsman Tim de Leede’s unbeaten 58 and part-time leg-spinner Daan Van Bunge’s haul of three for 16. England should have started their campaign against Zimbabwe in Harare on Thursday but instead boycotted the match on security grounds and were docked four points. Lancashire 20-year-old quick bowler Anderson, England’s find of the Ashes tour, bowled his 10 permitted overs straight through. After a steady start Anderson struck in the sixth over when he had Daan van Bunge caught in the gully by Craig White for four to leave the Netherlands 15 for one. His second victim came in the 10th over when left-hander Luke van Troost played across the line and was lbw for eight. Holland's’ problems got worse when, on 31, they lost three wickets for no runs in 10 balls. Bas Zuiderent (2), who has played for Sussex, then chipped Anderson straight to Nasser Hussain at mid-off. Two balls later Klaus van Noortwijk went for a duck, caught by diving wicket-keeper Alec Stewart down the legside. Anderson’s county colleague Andrew Flintoff then had one-day international debutant Nick Statham lbw for seven. But de Leede hit back with some well-struck boundaries, his fifty coming off 72 balls, including five fours as England failed to fully capitalise on Anderson’s start. FoW: 1-15, 2-22, 3-31, 4-31, 5-31, 6-67, 7-90, 8-108, 9-112. Bowling: Caddick 10-4-19-0, Anderson 10-1-25-4, Flintoff 10-2-29-1, White 10-3-22-2, Blackwell 10-0-37-2. As the players quietly walked out of the airport, trying their best to look normal, Indian skipper Sourav Ganguly dropped a line about how his continued failure with the bat did not mean that he was short on confidence. “When you are out of form you sometimes appear lacking in confidence. It surely is not the case with me,” said the captain who is under attack for his string of low scores in the last couple of months. There was no media session at the airport and the players drove straight to their hotel, to “introspect” on their performances as their captain said they needed to do. 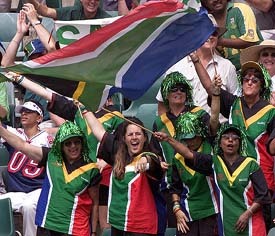 after yet another disgraceful performance had seen them being bundled out for their lowest-ever World Cup score of 125. “If you think England batted poorly in the Ashes series against Glenn McGrath, Brett Lee and Jason Gillespie, you should have seen India’s top seven batsmen — everyone a specialist — blown away for 64 runs between them,” The Sunday Telegraph said. A storm has been building around Ganguly. Runs have dried up and his usual flamboyance has been replaced with sullenness and suspicion. He has abdicated his responsibility as a skipper and without a direction from the top, the slant of the team has lost its’ long term view. It’s going through motions and for all practical purposes, it appears the World Cup campaign is as good as over in the very first week of the competition. Some of the pieces of advice which Ganguly hears wouldn’t have done his morale any good. The trouble is brewing even at home where Snehasis Ganguly, writing a column in a Kolkata newspaper, has criticised his younger brother for his batting as well the way he has gone for appeasement within the team. Ganguly should be his own man rather than a leader who is pushed around by seniors, warns Snehasis, which is all in good faith only the timing of the piece makes the captain shuffle in unease. It is true Ganguly is guilty of promoting an old boys club within the team. He has listened too often to seniors, Sachin Tendulkar and Rahul Dravid, and allowed himself to be led by their concerns rather than go by what he believes is good for the team. The younger members of the team have noticed the trend with disquiet and coach John Wright has found himself excluded in any decision-making process. Wright is a hapless man who shares his concerns about the atmosphere within the team with the people he trusts freely. But he hasn’t helped the cause either by not letting the board know about the unholy alliance within the team where merit sometimes take a backseat and personal equations dominate the decisions. Ganguly, apparently, was criticised for his dislike for hard work in the manager’s report from the New Zealand. It led to the board directive before the World Cup that the team would have at least two practice sessions every day and wives and families should excuse themselves from joining the cricketers during the World Cup. His dismissal against Australia at Centurion Park looked extremely tardy and irresponsible. Jeff Thomson, the legendary Australian fast bowler of the 70s, offered words of comfort “If it looked he didn’t move his feet while going for the shot, people must realize Brett Lee is so quick it is often difficult to move your feet towards the line of the ball.” Still compassion such as this is lost in the anger and hurt everyone feels at India’s humiliation at the hands of Australia. And as often happens in cricket, the captain feels the heat more than most. But then a lot has been Ganguly’s own doing. “The captain should be leading by example, especially when the team is low on confidence,” the cricketer-turned politician said. The Australian pre-match plan was to target Sachin Tendulkar but their task was made easier by the poor footwork of Sourav Ganguly and Virender Sehwag. Both Indian batsmen were unsettled by the pace and aggression of Brett Lee who used well-directed short-pitched deliveries to upset their footwork. This was a tactic Lee successfully employed against England in the VB series where the blonde enforcer relished taking the new ball. It was a smart move by Ricky Ponting to unleash him against the Indians. Whilst the Australians weren’t able to dismiss Tendulkar early they managed to make his task a lot more difficult by regularly taking wickets at the other end. Each time an Indian batsman was dismissed it made it more difficult for Tendulkar to take any risks and in this manner the Australians were able to stop him taking charge of the game. Glenn McGrath complemented Lee’s aggression by bowling in a miserly fashion at the other end and his three successive maidens were followed by a burst of quick wickets. Thanks to McGrath’s accuracy the Australians are hard to rattle, as the captain knows he can always call on the lanky quick to shut down one end. Jason Gillespie then compounded the Indians’ problems by combining pace and accuracy in bowling 10 overs straight and conceding only 13 runs. Gillespie removed the horribly-out-of-form Rahul Dravid and then bounced out Mohammad Kaif. He then delivered the coup de grace when he deceived Tendulkar with a slower ball. By clever use of all his skills Gillespie had reduced the Indian innings to tatters but I can’t help thinking that V V S Laxman’s gifted stroke play would have made life more difficult for the Australians than some of the airy fairy batting we witnessed. Ponting’s decision to empower Lee is another example of his growing maturity as a skipper. He performed brilliantly in a tight encounter in the last VB final and then handled the pressure of Shane Warne’s drug charge prior to the Pakistan game by making runs and marshalling his troops effectively. He has earned respect as a skipper and it’s time to consolidate the Australian captaincy once again by giving him the Test job in addition to the one day leadership. Ponting’s team has confirmed their favouritism in the World Cup with comfortable wins over two of the tougher teams in pool A. In typical fashion Matthew Hayden and Adam Gilchrist blasted the Indian bowling to ensure there were no hiccups chasing a small total. The amount of spin that Harbhajan Singh extracted from the pitch must have made the Indian batsmen feel ill, as a target of 250 would have really extended even this rampant Australian side. It was a spineless display from the Indian batsmen and perhaps the most surprised would have been the Australians. The toss was crucial, it was a fantastic track, and Ricky Ponting would have been anticipating a total of 260-something to chase. He got less than half of that, and must have been smiling all the way through the second session. In fact, had the Indian batsmen given the runs they should have, there could have been an interesting twist to the story. Both Harbhajan Singh and Anil Kumble were able to get some turn and bite even though they bowled with a hard ball, and were able to plant doubts in the minds of Matt Hayden and Adam Gilchrist. As I have mentioned earlier, this is end-of-season in South Africa, and the tracks here are providing more help to spinners than had been speculated. But 125 was a hopelessly poor score. The Australians were thoroughly professional in the field, but why should you expect any different? Their fast bowlers, and especially Jason Gillespie and Brett Lee bowled with fire and ambition to keep the Indian batsmen on a very tight leash. Lee looks stronger than he did even six month ago, and is bowling with aggression. It was a surprise of sorts to see him open the bowling, but Ponting obviously has a new game plan in place. Lee has responded superbly to his captain’s demands and I wouldn’t be surprised if he is among the leading wicket-takers in this tournament. But the best bowler of the day was clearly Gillespie. He was fast, he was accurate, and he also had the most variety. Having said that, the batsmen dug their own graves with some senseless batting. Both Sourav and Sehwag were out chasing wide deliveries, and Kaif played a hook shot when his primary job should have been to keep Sachin company. Tendulkar looked at his best in the early overs, but lost his rhythm with the fall of these wickets, and Dravid’s inability to work the ball off the square was evident. The captain’s personal form is rotten and I see no sense in him continuing to open the innings in this touch. It gives the opponents that much more hope and puts his own team under pressure. Sourav is a versatile batsman to come good even in the middle order because he is such a fantastic striker of the ball. He does not necessarily need the first 15 overs and field restrictions. Some of the batting I saw from India, surprised me on Saturday. I think the problem was that they were trying too hard, and as a result were going for balls that they should have left. This always makes the life of a bowler that much easier, since when batsmen try to attack too much, the bowler just has to wait for them to make the error. India always have traditionally had trouble playing extra pace, and this prompted our think tank to make Brett Lee open the bowling. Sourav Ganguly, who has been having the horrors since New Zealand, was the first one who seemed to be trying too hard, and while over-attacking, he chased a pretty wide ball. 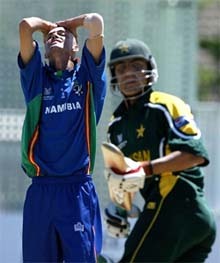 Virender Sehwag, too did not do his reputation much good, by chasing a possible wide. Sachin Tendulkar looked in very good touch at the beginning, and if one of the batsman had hung on, who knows, he could have made a difference. However, seeing six wickets fall in such an alarming manner seemed to rob him of his rhythm. Jason Gillespie was outstanding once again. He has been a little unlucky over the last couple of seasons, so it was great to see him have a man-of-the-match-winning performance at Centurion, and the moment when he deceived the little master with a slower one was really special for him. The hopes of a billion people lay grounded by a pathetic, spineless batting display. More than the loss, the ignominy of the defeat is hard to digest, as India were pummeled into submission by Australia at Centurion on Saturday. The lack of commitment and a desire to perform were starkly evident in a side that did not realise that while winning is not everything, wanting to win is. Contests allow no excuses. After it huffed and puffed to victory against the lowly Holland, India stuttered against the might of the Australians. India’s problems stem from the fact that the most vaunted batting line-up has come a cropper in the recent times. With 67 one-day international centuries under its belt, it is a shame that such a line-up has not lasted 50 overs in eight of the last 10 games. The top-order made no impression against the Australians on Saturday. As many as five of the top six batsmen did not reach double-figures, making just 15 runs among them. They were like envelopes without addresses - they weren’t taking you anywhere. If the Indian team sets about examining its troubles, it will probably find its own name on them as manufacturer. And this is more due to lack of application than potential. To know what is right and not to do it is worse than cowardice. It seemed as if India did not have a reasonable gameplan in place, let alone succeed in executing it. A mere look at the Australian line-up was enough to convince anyone that they had chosen three specialist fast medium bowlers and were banking on the likes of Brad Hogg, Andrew Symonds and Darren Lehmann to handle 20 overs. Getting Brett Lee to open the bowling was a masterstroke. He is in prime form, swinging the ball at great pace and it was prudent that the Australians promoted him to bowl with the new ball. It is hard not to wonder at the resilience of Ricky Ponting’s team, which did not buckle under pressure against Pakistan and was on top of its game on Saturday. By the time Ponting brought his lesser-known bowlers on, India were left with no batting, their resources depleted. It was impossible to recover from a situation where India lost five wickets in a cluster, failing to spring a worthwhile partnership to bail them out of trouble. That the biggest stand of the innings was the eighth-wicket partnership between Harbhajan Singh and Anil Kumble is a telling comment on the team’s approach. Sourav Ganguly’s batting in recent time is like a nervous breakdown in slow motion. He flirted with danger for the umpteenth time and paid the price yet again. The Aussies do their home work well and that reflected in the way in which Virender Sehwag was treated to a flurry of short-pitched balls and led to his chasing a wayward delivery, spelling his own demise. Sachin Tendulkar, who had got into a momentum, lost the impetus because of the lack of rotation as Rahul Dravid was like a stick in the mud, unable to play his assigned role to any levels of satisfaction. Yuvraj Singh got a bad decision while Mohammed Kaif was baited into a trap. It was impetuous of him to go for the big shot without getting his bearings right. Flaming youth cooks it’s own goose. A drowning man can clutch to a straw but never successfully. A total of 125 was never going to be enough against Australia. Ganguly was left with no option but to try to bowl the Aussies out, never a realistic proposition. India needed to make early inroads into the Australian batting but the Gilchrist-Hayden blitzkrieg made the team throw in the towel soon enough. Where does India go from here? It can attempt a few changes in the side — get Sehwag to open the innings and have Ganguly at No. 3 or give itself an additional seam bowling option in place of a spinner but that will not exactly set the world alight, will it? The one change that can help the team is its attitude and application. India will find that the largest room in the world is the room for improvement. India will have to work out of its skin to beat Zimbabwe in its own backyard in the next game. The spongy pitches at home can make Zimbabwe a larger threat than its weak bowling attack may make it seem. If India does not gird its loins soon enough, you can be sure that aspersions will be cast on the credibility of the batting line-up. In fact, more than cricket it has been the issue of contracts, ambush marketing, endorsements and advertisements which has been uppermost in the minds of the players ever since they returned home from their disastrous tour of New Zealand late last month. The short break the players got before they left for South Africa was used to shoot commercials, sign endorsements and attending celebrity events instead of resting their tired limbs, spending quality time with their family and working out strategies for the World Cup. But what was even more surprising is the fact that the powers that be that control the Board of Control for Cricket in India (BCCI) opted to maintain a stony silence when the players went about doing everything but thinking or playing cricket. Instead of stepping in and telling the players to rest and stay away from commercial shootings and other off-the-ground activities, Mr Jagmohan Dalmiya and his cronies opted to watch with a benevolent eye the activities of the ‘‘hope of the entire nation’’. As it is the Indian cricket player is the most pampered lot — and the ensuing World Cup has only helped him to add on to his already overflowing riches — and by maintaining total silence on the issue of advertisements and endorsements the BCCI willy-nilly has played right into the hands of not only the ICC but also the international cricketing community which knowing very well that without India no international cricketing event can be conducted, with three of the four principal sponsors of the 2003 World Cup being from India, only turned the screws when the going became tough for the Indians. And now that the tournament is well under way, the ICC is trying to pin down the Indian players by pointing out to the ambush marketing clauses thereby putting the Indian players under additional pressure at a time when they have to be totally focussed on the game. True, Australia beat India all ends up on Saturday but there is no denying the fact that India probably slid to their doom also on the mindgame. But everything is not lost. India still have four games to go in the tournament and can still, at least theoretically, hope to make it to the super six. But for that to happen the Indians must be totally focussed on the game and leave out everything extraneous (including answering to the ICC on the ambush marketing issue) to the team management to solve. Easier said than done but that is the only way India can hope to get back to the winning ways. The team has to perform on the field. Everything else is secondary. The jinxed inaugural Afro-Asian Games may be put on hold yet again if the USA take military action against Iraq, it is learnt. The Indian government is also learnt to be keeping a close watch on the developments arising out of England’s refusal to play in Harare (Zimbabwe) in the ongoing World Cup Cricket Championship, as India do not want to get into any needless diplomatic scrap when the Afro-Asian Games are held. Hyderabad is all set to host the Afro-Asian Games as the government is firm on not spending any money in upgrading the sports infrastructure for hosting the games. The government has already sunk crores of rupees in upgrading the stadiums, laying a new synthetic athletic track at the Jawaharlal Nehru Stadium and two brand new hockey turfs at the Dhyanchand National Stadium in Delhi. The government has also spent around Rs 55 lakh on the Afro-Asian Games secretariat, and for meetings of the organising committee. The inaugural Afro-Asian Games were to be held in Delhi in October-November 2001, but got postponed following terrorist attacks in the USA on September 11 the same year. The Afro-Asiad could not be held last year due to the Asian Games, and the IOA secured fresh consent from the African and Asian countries to host the games in October-November this year. With the Iraq war, however, looming large, the government has adopted a guarded approach, though tentatively, Hyderabad has been asked to get ready to host the games. If the games are held in Hyderabad, the Union Government does not have to spend much on them, as the world class stadiums created for the National Games require no further additions and refurbishing for the Afro-Asiad. 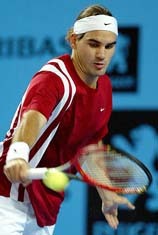 All-India Council of Sports president Vijay Kumar Malhotra confirmed that Hyderabad would host the games. 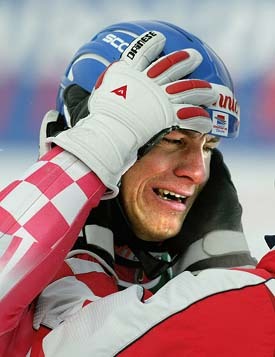 But he too was non-committal whether the games would be held at all. Meanwhile, it is learnt that the Indian Olympic Association (IOA) is still keen on sending the Indian contingent for the South Asian Federation (SAF) Games to be held in Islamabad, Pakistan, from March 29, though the External Affairs Ministry, in consultation with the Sports Ministry, has decided to pull India out of the 10-day games, citing security threat as the reason. IOA president Suresh Kalmadi would be briefing the media about IOA’s “stand” regarding the SAF Games tomorrow. Down by two goals, Dempo fought back gallantly to hold East Bengal 2-2 and share points in the National Football League here today. For East Bengal, Mike Okoro scored in the 18th minute and Douglas D’ Silva in the 20th minutes while for Dempo goals came through Jose Colaco in the 27th minute and Mario Soares in the 38th minute. All the goals came in the first half. With this drawn match, East Bengal maintained their unbeaten spree and remained on the top of the table with 34 points from 14 outings while Dempo with 22 points came on par with Mohun Bagan but remained on the same fifth place with equal number of outings. CHENNAI: After four successive losses, local outfit Indian Bank grounded Hindustan Aeronautics Limited (HAL), Bangalore, 2-1 in the National Football League here today. After a barren first half in which the bankmen held sway over the proceedings, Joseph put Indian Bank ahead in the 55th minute. However, the visitors restored parity in the next minute through Rajendra Prasad. Scoring thrice in quick succession, Tollygunge Agragami humbled local outfit ITI 4-0 in the Oil PSU Seventh edition of the National Football League here today. Forward Ashim Biswas scored twice while Nigerian strikers Akeem Abolonie and Mosses N Oira accounted for the other goals. Pakistan today said it would go ahead with the South Asian Federation (SAF) Games as scheduled despite non-participation by key member India. Current champions and star studded Northern Railway, Delhi, defeated Western Railway, Mumbai, 2-0 to retain the title in the VIIth All-India Mohinder Partap Singh Grewal Women’s Hockey Tournament which concluded at the Astro Turf ground of Punjab Agricultural University here today. Both the goals were scored in the first half. In a keenly contested final, NR eves, after making repeated attacks went ahead in the 7th minute when Kiran Saini, cashing in on defensive lapse, sounded the board, leaving WR custodian Tingolima Chanu shocked WR forwards weaved some good counter attacks but could not get the desired results. NR players got two penalty corners (17th, 23rd) but failed to consolidate the lead as the hits taken were well padded away by Chanu. They, again caught the WR defence napping just a few seconds before the lemon break when Neha picked the ball inside the striking circle and gave it to Pritam Wirach who blasted the tall-home to make it 2-0. In the second session, WR girls went all out for the equaliser but the Northern Railway defence functioned adequately to ward off danger posed to their citadel. Midway, Pavlina Surin of WR combined well with Nishu Chawan and entered the D, and took a hard hit but the ball went on the side line. Likewise, in the dying minutes of the encounter, NR players too failed on two occasions to increase the lead. Mr Tej Parkash Singh, Transport Minister gave away prizes. He announced a grant of Rs 50,000 for the organising committee. Pritam Wirach of Northern Railway was adjudged ‘player of the tournament’ and received a cash prize of Rs 5,000. Tingolima Chanu of Western Railway (best goalkeeper), Suman Saini of Northern Railway (best forward), Shina Kisputta of WR (best half) and Jasjeet Kaur of Sri Guru Nanak Pritam Senior Secondary School, Shahbad Markanda (best forward) got cash prizes of Rs 1,000 each. During international kabaddi competition, Sher-e-Punjab Kabaddi Academy of DAV College, Jalandhar, bagged the first prize carrying a cash prize of Rs 1.51 lakh, while DAV Kabaddi Club, Bathinda and German Dues Berg, Germany secured the second and third positions, respectively. Members of the DAV Kabaddi Club, Bathinda, were given Rs 1 lakh cash and German Dues Berg team members were given a cash prize of Rs 50,000. In tug-of-war, Gurdaspur outclassed the rivals in the final to win the title, while Ludhiana were declared second. Results: (wrestling): Sher-e-Hind: Amandeep Sondhi (1), Sandeep Kumar (2), Pawan Kumar (3). Aaftab-e-Hind: Chand (1), Jai Bhagwan (2), Jang Bahadur (3) Sitar-e-Hind: Sikandar (1), Omveer (2), Rampal (3) Punjab Kumar (under-16) Cheenu (1), Surajveer (2), Kuljoot (3). Shan-e-Hind: Sandeep (1), Rakesh (2), Kuldeep Singh (3) Mahabharat Kesri (women): Sonika (1), Gursharan (2), Sumanpreet (3) Bharat Kumar: Baljeet Kumar (1), Jasdeep (2), Satinder (3). The Rs 35 lakh tournament is being sponsored by the England-based Purewal brothers to promote rural sports in Punjab. “The tournament is aimed at promoting rural sports in the state. We are trying to involve rural youth in sports to curb the menace of drugs, which is harming the physical fitness of youth, Mr Sukhdeep Singh, press secretary of the tournament said. Sports events, which form part of the ongoing Patiala Heritage Festival, commenced on a vibrant note here today. A one-day golf tournament was held at the Army golf course, known as Black Elephant, today, cricket, polo, kabaddi and other rural sports will also be played. A cricket match, stated to be played between the Punjab XI and the Rest of India XI, will be featuring international stars like Shiv Sunder Dass, Debashish Mohanty, Vikram Rathore, Pankaj Dharmani and Reetinder Sodhi. About seventy golfers participated in the golf tournament. Prominent among the amateurs who took part in the tournament were former hockey Olympian Balkishen Singh, Bunny Sandhu, Rajdeep Sandhu and Brig C.S. Harika. The event was inaugurated by Mr Malvinder Singh, brother of the Chief Minister Capt Amarinder Singh, who could not attend as he is busy in the Himachal Pradesh elections.